The compound word ’’Keiyō’’ (京葉), which refers to the Tokyo-Chiba region, is formed from the second character in Tokyo (京), and the second character in Chiba (葉), which can also be pronounced “kei” and “yō” respectively. This compound is used in terms such as the Keiyō Line, Keiyō Road, Keiyō Rinkai Railway Rinkai Main Line, and the Keiyō Industrial Zone. Chiba Prefecture was settled in prehistoric times, as evidenced by the Jōmon period remains in every part of the region. The prefecture holds the largest kaizuka sea shell mounds in Japan, evidence of a large population in the prefecture that relied on the rich marine products of the Pacific Ocean and Tokyo Bay. Kofun burial mounds are found across the prefecture, with the largest group being in Futtsu along Tokyo Bay. In the Asuka period (538 – 710), under the Taika Reform of 645, the administrative structure of present-day Chiba Prefecture changed significantly. The historical province of Fusa Province, which may have covered much of Chiba and Ibaraki prefectures, was divided into two provinces: Shimōsa Province (also called Shimofusa) in the north and Kazusa Province in the southern area. Awa Province at the south of Chiba Prefecture, was separated from Kazusa Prefecture in 718. These administrative units existed until they were abolished and merged into Chiba Prefecture after the Meiji restoration. 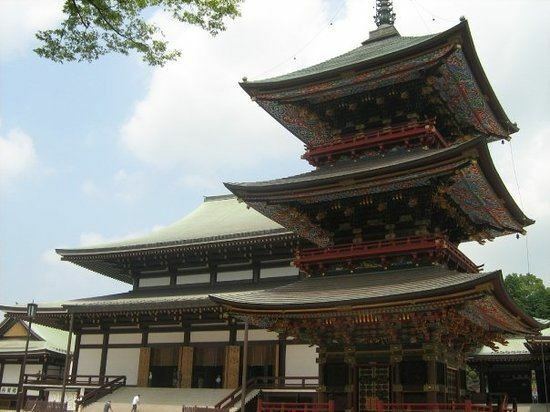 The central government established a kokubunji provincial temple in each province. The imperial court gradually extended its authority over the three provinces in the Nara (710 – 794) and Heian (794 – 1185) periods. Shōen feudal estates were established across the three provinces, and the region became an important source of tax revenue, agricultural and other products to the capital in Kyoto. As the Heian period progressed, however, the kokushi provincial governors came to exert military power independent of the central government in Kyoto. The Chiba clan broke entirely with the imperial court and was instrumental in the establishment of the Kamakura shogunate. Chiba Prefecture was established on June 15, 1873 with the merger of Kisarazu Prefecture and Inba Prefecture. The 1923 Great Kantō earthquake caused widespread destruction in Chiba Prefecture, most notably in the southernmost part of the Bōsō Peninsula, where 1,300 residents were killed. Areas of the prefecture adjacent to Tokyo saw much damage, and mob violence against Koreans and other ethnic minorities occurred in the chaos after the earthquake in Funabashi, Ichikawa, and other areas. Koreans in several neighborhoods of Yachiyo were killed, and a tower was erected in 1972 near Yachiyodai Station to memorialize those killed in the incident. The militarization of Chiba Prefecture dates to the Russo-Japanese War (1904–1905). Coastal fortifications were built along Tokyo Bay as far south as Tateyama to protect the capital of the Japanese Empire from attack. In the 1930s the north and central areas of the prefecture became a center of large-scale military production, and military bases and fortifications were constructed in most coastal areas of the prefecture. After the United States took control of Saipan the northern part of the prefecture, most notably the city of Chiba and Chōshi, were firebombed. Much of the industrialized north of the prefecture was destroyed. Operation Coronet, one of two parts of Operation Downfall, was the planned land invasion of Tokyo in March 1946 by the United States. Coronet planned Kujūkuri Beach as one of two initial landing bases, the other being Hiratsuka via Sagami Bay. The U.S. First Army would enter at Kujūkuri, sweep across the Bōsō Peninsula, and meet the U.S. Eighth Army at Tokyo. After the atomic bombings of Hiroshima and Nagasaki but due to the surrender of Japan in 1945, the plan was never carried out. During the Occupation of Japan (1945–1952) Chiba Prefecture was controlled by American forces from the second floor of the prefectural capitol building in the city of Chiba. Numerous other cities in the prefecture, including Chōshi to the north and Tateyama to the south, were used as bases of the occupation. The rich agriculture areas across the prefecture protected the region somewhat from the level of food shortage and starvation immediately following the war. The immediate post-war period was characterized by carefully planned industrial expansion in the north of the prefecture and the significant increase of agricultural production after land reforms across the prefecture. The Keiyō Industrial Zone brought together smaller industrial areas along the entirety of the western coast of Chiba Prefecture, and the industrial zone became, and remains an important center of heavy industrial production and large-scale port facilities in Japan. Cities to the northeast of the prefecture in close proximity to Tokyo were connected by rail to the capitol, and became and remain bedroom communities to Tokyo. Narita International Airport began operation in 1978 in Narita after much protest to replace the overcrowded Tokyo International Airport (Haneda Airport). The majority of international air traffic enters Japan via Chiba Prefecture. Agriculture, specifically of rice, and also vegetables to serve the Greater Tokyo Metropolitan Area expanded greatly and became a source of income to the northeast and central areas of the prefecture. Agriculture expansion of the central and southern regions of the prefecture was in contrast to the depopulation of these areas as a significant part of the population moved to the northeast of the prefecture as a result of the urbanization of Japan, a process that continues into the 21st century. The 2011 Tōhoku earthquake and tsunami affected areas as far south as Chiba Prefecture. While the loss of life and damage to housing and industry was far less than in the Tōhoku region, 20 people were killed in Chiba Prefecture, mostly from the tsunami that hit Asahi to the northeast of the prefecture and caused 13 deaths. An oil refinery fire, widely seen in the news media following the Tōhoku earthquake, was at the Cosmo Oil Chiba Refinery in Ichihara. Large liquefied petroleum gas (LPG) tanks burned from March 11–21, 2011. Soil liquefaction in areas of reclaimed land across the northern and western areas of Chiba Prefecture caused damage, primarily to housing. Chiba City, Funabashi, Narashino, and especially Urayasu were greatly affected. As a result of permanent damage to housing stock due to soil liquefaction and evidence of radioactive materials, the population of Chiba Prefecture fell for the first time since 1920. With the exception of the large-scale Keiyō Industrial Zone in the northeast, the entirety of the coast of Chiba Prefecture is protected as two quasi-national parks and one prefectural natural park under the national park system of Japan. As of 1 April 2012, 6% of the total land area of the prefecture was designated as Natural Parks. Suigo-Tsukuba Quasi-National Park encompasses a large area of the Tone River basin and the area around Mount Tsukuba in Ibaraki Prefecture. The park was established in 1953 to protect not only the environment of the area, but also its unique cultural heritage. The mouth of the Tone River and to Cape Inubō and Byōbugaura in northeastern Chiba Prefecture make up the southern part of the park. Minami Bōsō Quasi-National Park was established in 1953 to protect much of the southern coastal areas of Chiba Prefecture from Cape Futtsu on Tokyo Bay to Cape Inubō in northeastern Chiba Prefecture. The park spans across nine administrative districts in the prefecture. Minami Bōsō Quasi-National Park was established to protect not only the environment of coastal areas, but also the unique cultural assets of associated with these areas, notably the temples associated with Nichiren. Chiba Prefecture has designated and maintains eight prefectural natural parks to protect both natural and cultural areas, namely the Inba Tega, Kasamori Tsurumai, Kujūkuri, Mineokasankei, Ōtone, Takagoyama, Tomisan, and Yōrō Keikoku Okukiyosumi Prefectural Natural Parks. Cities, towns, and villages in the prefecture also have designated and protected parklands. These parks are maintained for environmental protection as well as providing local recreational facilities. Chiba Prefecture is home to one of Japan's largest industrial areas. Prior to World War II manufacturing in the prefecture was centered on the brewing industry, specifically the production of soy sauce, sake and mirin sweet cooking sake. The manufacturing sector expanded greatly after the war. The prefecture was chosen as the site for a major Kawasaki Steel factory in 1950. In the same period the prefectural government embarked on a large-scale land reclamation program to dredge large plots of waterfront property. The large-scale construction of factories, warehouses, and docks on this reclaimed land around the Tokyo Bay area ultimately formed the Keiyō Industrial Zone. Chiba Prefecture is now 6th in Japan in industrial output with the bulk of the industry focused on the petroleum, chemical, and steel and machine industries. Together, these industries account for forty-five percent of the prefecture's exports. In recent years, the government has funded more than eighty industrial parks to bring development further inland as well. The prefecture also boasts Japan's overall second-highest agricultural output. Among all the prefectures, only Hokkaidō produces more agricultural products, and Chiba leads Hokkaidō in vegetable production. Peanuts are considered a specialty product of Chiba: 78 per cent of the country's peanuts are produced in the prefecture. Chiba Prefecture leads the nation in the production of several vegetables, including carrots; cabbage; daikon radish; negi, the ubiquitous Japanese cultivar of the Welsh onion; loquat; nashi, the Japanese cultivar of the pear, which has a two hundred-year history of cultivation in the prefecture; tomatoes; and spinach It is the nation's second largest producer of corn. Rice is also grown, and seaweed, specifically nori, is harvested in large quantities from Tokyo Bay. Chiba's population is one of the wealthiest in Japan due to the prefecture's strong commercial and industrial sectors. Per capita GDP is ¥3.1 million, the fifth-highest in the country. 70% of the population is employed in the service sector, with 25% in industry and 5% in agriculture. 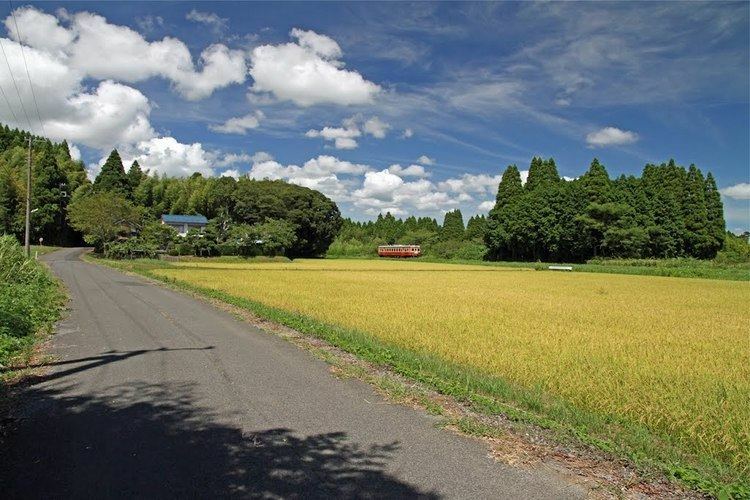 Chiba Prefecture has a Humid subtropical climate (Koppen Cfa) with hot, humid summers and mild, cool winters. The tsuyu rainy season occurs for approximately 50 days from June to July. The Chiba Prefectural Board of Education oversees municipal school districts in the prefecture. The board also directly operates the prefecture's public high schools. Chiba Prefecture is home to one national-level museum and several prefectural and local museums. The National Museum of Japanese History is located in Sakura and focuses on the history, archaeology, and folk culture of Japan. The Chiba prefectural museums consist of a main museum, the Natural History Museum and Institute, Chiba in the central Chuō-ku ward of Chiba City, and six branch museums throughout the prefecture. The Chiba Prefectural Museum of Art is in Chiba City. The Chiba Prefectural Boso-no-mura in Sakae focuses on the local culture of the late Edo period, and the Chiba Prefectural Otone Museum in Katori focuses on the culture of the Tone River basin. The reconstructed Japanese castles of Sekiyado and Ōtaki host regional historical museums. The Chiba Museum of Science and Industry is located in Ichihara on the site of a former factory, and the Coastal Branch of Natural History Museum and Institute, Chiba in Katsuura focuses on the marine environment of the Pacific Ocean coast. Numerous other municipalities in the prefecture also host museums. The Chiba Prefectural Library consists of three libraries. The Chiba Prefectural Central Library is located in the central Chuō-ku ward of Chiba City directly southwest of Chiba Castle and in close proximity to the City of Chiba offices. The Central Library houses a general collection as well as the central research collection for the prefecture. The Chiba Prefectural West Library is located in Matsudo next to the Matsudo Museum, and houses a research collection focused on natural history and the fine arts. The Chiba Prefectural East Library is located in Asahi, and houses a research collection focused on the literature and history of the prefecture. The Chiba Prefectural Archives are located across the Miyako River from the City of Chiba offices. The archive maintains a collection of rare books and materials from across the prefecture, as well as materials related to the administration of Chiba Prefecture. Each municipality in the prefecture maintains a local libraries, and many shrines and temples maintain archival collections related to their institutions. 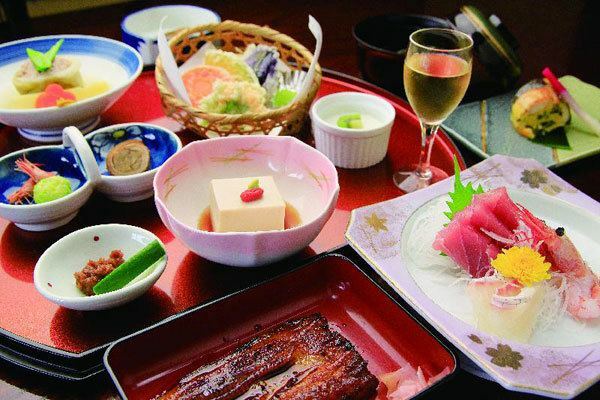 The traditional diet of Chiba Prefecture is not fundamentally different than that of the rest of Japan. 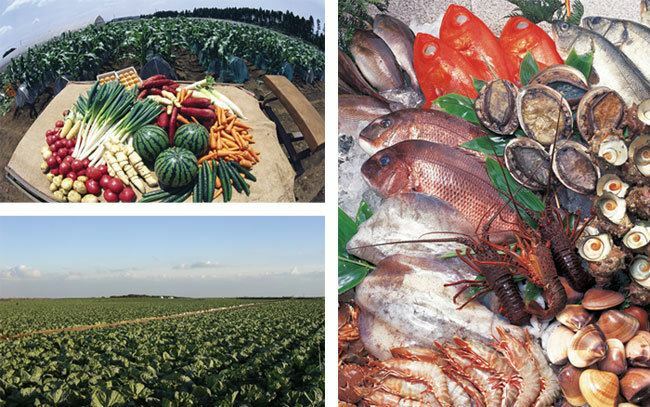 Chiba Prefecture produces prolific quantities of rice across all areas in the prefecture, vegetables in the northern area of the prefecture, and fish, seafood, and shellfish along the coastal areas of the prefecture. Chōshi has been a major center of worldwide soy sauce production since the Edo period, and the prefecture remains the top producer in Japan. Kikkoman is headquartered in Noda in northwestern Chiba Prefecture. These are all important components of Japanese cuisine. Certain local products, however, are grown in abundance and have resulted in several dishes unique to the areas. Peanuts, grown in great quantities in the prefecture, appear fresh in markets in the prefecture and are eaten boiled as a snack. Miso paste mixed with peanuts is also produced in Chiba. Takenoko, whole bamboo shoot, are harvested in the central part of the Bōsō Peninsula. The takenoko of Ōtaki lack the concentration of arsenic typically found in uncooked bamboo shoots, and as such, are uniquely eaten raw in the area as "takenoko sashimi". Futomaki or futomakizushi, literally "fat roll", is a large version of the sushi roll. The futomaki popularly made in Chiba Prefecture is up to 4 inches in diameter. Futomaki in Chiba Prefecture often utilize various ingredients to form a pattern, such as a flower or a kanji character, when the roll is cut and served. The prefecture plays host to two major events in the Japanese athletics calendar: the International Chiba Ekiden and the Chiba International Cross Country. The following sports teams are based in Chiba. Most Tokyo-bound visitors arriving on international flights land in Narita International Airport, which is situated in Narita in the north of the prefecture, and connected to Tokyo by the East Japan Railway's Narita Express and the Keisei Electric Railway's Skyliner. The Tokyo Disney Resort is located in Urayasu near the western border of the prefecture. There are also a number of tourist sites on the Chiba peninsula, such as Nokogiriyama; Kujūkuri Beach; and Onjuku beach. Since 2009, the prefectural governor is Eiji Suzuki, better known under his stage name as Kensaku Morita, former actor, member of the House of Representatives (LDP/Independent – Tokyo 4th district) and member of the House of Councillors (Independent – Tokyo). He was reelected overwhelmingly to a second term as governor in the March 2013 election against only a Communist challenger and a minor, unaffiliated independent. The assembly of Chiba Prefecture has a regular membership of 95, elected in 45 electoral districts, currently still in the unified local election cycle of 1947 (last round 2011). As of July 2014, it is composed as follows: LDP 52 members, DPJ 13, Kōmeitō 7, JCP 4, Shimin Net/SDP/Independents 4, Your Party 3, four other caucuses with 5 members in total. In the National Diet, Chiba is represented by 13 members from single-member districts in the House of Representatives, and six members (three at-large per election) in the House of Councillors. After the most recent Diet elections of 2010, 2012 and 2013, the prefecture is represented by eleven Liberal Democrats and two Democrats in the House of Representatives, and three Liberal Democrats, two Democrats, and one Your Party member in the House of Councillors. Current Diet members from Chiba include former prime minister Yoshihiko Noda (H.R., DPJ – 4th district) and former ministers Kuniko Inoguchi (H.C., LDP – class of 2010) and Motoo Hayashi (H.R., LDP – 10th district). As of 2014, Chiba is divided into 54 contiguous municipalities (see list above): 37 cities, 16 towns and one village, as in all of postwar Japan each with a directly elected mayor and assembly. The most populous and Chiba's only designated major city is the capital Chiba City. Two cities, Funabashi and Kashiwa, are core cities. After late 20th century mergers, much of the rest of the prefecture is also organized in independent cities: Of the (today purely geographical) counties, only six remain, four of which have only one or two remaining towns or villages. – After the reorganization of county and municipal governments in all prefectures in 1889/1890, there had initially been 12 counties and no city in Chiba; Chiba town in Chiba county became the first municipality in Chiba to be elevated to city status in 1921. While by far not as large as that of neighbouring Tokyo, Chiba's police force is among the country's ten largest at more than 10,000 members (including the Narita airport police). As in every prefecture, the police is supervised by the public safety commission; its five members are appointed by the governor with approval by the assembly. Wisconsin in the United States (1990). Novels set in Chiba include: Neuromancer by William Gibson (set in Chiba City), Ningen Shikkaku by Osamu Dazai (Funabashi), and Nogiku no Haka by Sachio Itō (Matsudo). Manga (comics) representations include: Be Free!, Chameleon, Kyō Kara Ore Wa! !, Makuhari (set in Chiba city), Makuhari Saboten Campus (Chiba city), Susume!! Pirates, and Urayasu Tekkin Kazoku (Urayasu). Anime (animation) representations include: The Family's Defensive Alliance (set in Funabashi), Battle Programmer Shirase (Narashino), My Teen Romantic Comedy SNAFU and Zegapain (Urayasu). TV series representations include: Kisarazu Cat's Eye (set in Kisarazu), Miotsukushi (Chōshi), Beach Boys (filmed in Tateyama and Shirahama (now Minamiboso) and Yappari Neko ga Suki (Chiba).